SHAUN Johnson has shone in his first appearance for Cronulla, playing a role in two of their five tries in a 30-6 pummelling of Newcastle in Maitland. Johnson was involved in tries for Josh Dugan and Sione Katoa either side of half-time, and pinpoint as the first-choice general play kicker on Saturday. The former Warriors star also landed a perfect four goals from as many attempts, the last of which came from the sideline, before being substituted after the 50-minute mark. Captain Paul Gallen also warmed up with a strong 30-minute effort, and fullback Matt Moylan looked sharp behind a dominant forward pack. The Sharks showed no after-effects of the hammer finally coming down on their salary cap saga on Friday, which is likely to result in a player being pushed out. Their new-look spine of Moylan, Johnson, Chad Townsend and Jayden Brailey appeared on song in attack, and their defence was robust. Young halfback Kyle Flanagan, son of former coach Shane, set up Chad Townsend for a long-range try moments after substituting Johnson. 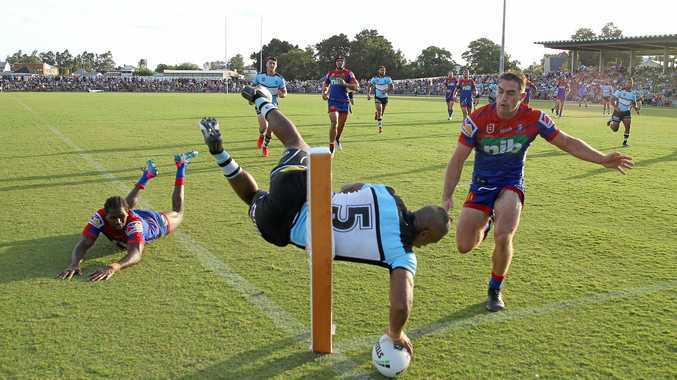 For the Knights, stars Mitchell Pearce, Kalyn Ponga and Connor Watson were devoid of opportunities until the Sharks cleared their bench in the second half. Ponga did throw a long ball for Jirah Momoisea to score their first try in the 68th minute, and marquee signing David Klemmer produced a handful of strong runs. Rookie Sharks coach John Morris pulled a number of his stars early, while Knights counterpart Nathan Brown gave his team regular-season minutes.